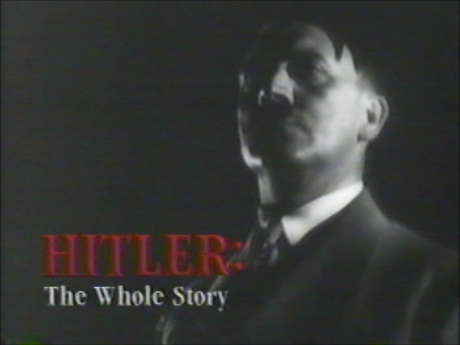 Hitler: The Whole Story (1989, CINE-ART/Munich), is a two and a half hour documentary providing an overview of the life of Adolf Hitler from birth, to his days as a homeless vagrant, his military service, and finally his rise and fall from power as dictator and war monger. Rare footage, including color film shot by Eva Braun, provide a look at Hitler’s private life as well as German life under the Nazis. The complete recording is presented below, a digital copy of a 1989 videotape distributed by the Discovery Channel. Originally titled Hitler: A Career, this documentary is one of the best reviews of Hitler’s life and provides a focus on the various influences that contributed to his psychological make-up. All too often Hitler is simply dismissed as a “monster,” but he was not. Indeed, his behavior was rooted in very human insecurities; however, that spark of conscience that keeps the devil on our shoulder from having too much say was absent from Hitler's soul. He became a brutal, cruel man who demanded from others what he could not do himself and sought power as a buttress for his own psychologically maladjusted outlook on life. I saw this documentary in early 1990 and it launched a hitherto untapped interest in Hitler and the Nazi regime. While I grew up with a multitude of World War II vets, and was inundated with various epic films on the topic, I did little reading of the conflict apart from my school studies. As an administrator for a local college, I could take books out of the library for an entire semester, and I did so with a vengeance. I poured through all the important biographies of the major Nazi figures, U.S. Army psychological reports, and classic documentary series like The World at War, which, in my opinion, still has yet to be surpassed. What I find compelling about Hitler is how his life is a study in brutality and irrationality, from the severe beatings at the hands of his father to his genocidal rage as an adult. Hitler, however, remains an enigma for certainly others have been physically abused and homeless, but did not lose their humanity. His career is as much a result of luck and timing as it was fear and brute force. In this documentary we get a glimpse at the complicated mix of events and sociopathy that created Hitler and the Nazi phenomenon. If Hitler kept his anti-Semitism in check and still pursued a war with the West and Russia it is likely many German Jews and other minorities would have fought in the army, as they did in World War I. In fact, it was a Jewish officer who recommended Hitler for the Iron Cross in the Great War. What we learn in this documentary, however, is that Hitler did not love Germany, or Germans — Aryan or otherwise. In the end, he abandoned them to a fate he engineered. He was so scared of the world that he needed to either mold it to his wishes or destroy it. Indeed, it is this fear of the world, fear of those unlike ourselves, that has driven many to commit heinous acts against humanity — a phenomenon that is played out to this very day. A study in microcosm on how the Nazi’s were able to manipulate German society to attain and maintain control is available in my essay The Nazi Seizure of the German Peoples’ Community. JFK Assassination: As It Happened, is a six hour and fifteen minute NBC news compilation of footage following the assassination of President John. F. Kennedy on November 22, 1963. The program provides raw minute-by-minute coverage beginning just before 2:00 P.M. ET and ending shortly after 8:00 P.M. ET. The viewing experience is very much like a time machine – we are transported back to that day and that time and that moment when many historians argue the turbulent 1960s really began. The complete recording is presented below, a digital copy of a VHS videotape recorded in 1993 from a public television broadcast. NBC news anchors and correspondents featured include Frank McGee, Bill Ryan, Chet Huntley, David Brinkley, Merrill Mueller, Robert MacNeil, Tom Pettit, Edwin Newman, and John Chancellor. The technology of the times is pushed to limits as engineers frantically switch between studios, film segments, and reporters breathlessly rushing in with the latest breaking news. At a time when cameras where heavy and had vacuum tubes, film had to be developed and then edited and spliced with a razor and tape, and teletype instead of computers, one is amazed at how efficiently the crews got the news on-air. I explore the assassination of President Kennedy in depth in the Aeolus 13 Umbra article The Assassination of Lee Harvey Oswald. 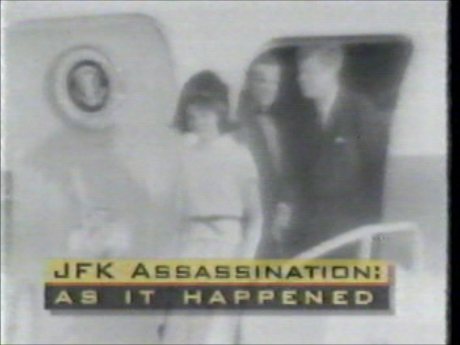 Growing up in the wake of the assassination, I came to believe that there was a vast conspiracy to kill the president. In fact, in 1990 I began to research the tragedy in order to find documentation to support my preconceived beliefs, yet I discovered just the opposite. While others may have wished Kennedy dead, Oswald was the only assassin and did so out of purely personal reasons, mainly a sociopathic need for narcissistic self-aggrandizement that he hoped would have resulted in a war between the United States and the Soviet Union. Readers, of course, are free to draw their own conclusions; however, in the nearly 25 years since I came to the realization that Oswald acted alone I have encountered no evidence to change my mind. Skeptical readers are invited to read the article above for more information. Apollo 11: As It Happened is a six-hour compilation of ABC News coverage of the Apollo 11 launch, Moon landing, and return to Earth, July 16 – 24, 1969. No commercials. No narration. Just six hours of pure, unadulterated news coverage – enough to satisfy even the most hard-core fan of the space program or news junkie. The complete recording is presented below, a digital copy of a VHS videotape recorded in July 1994 from a public television broadcast. As I was born in 1964, I grew up with the space program and counted astronauts among my first role models and heroes. I can even remember the Moon landing, sort of. I was four years old and my family was vacationing in Wildwood, New Jersey. It was a few minutes before 11 P.M. and I was drifting in and out of sleep when my father abruptly woke me up just in time to see Neil Armstrong walk on the moon – which I did, and immediately fell back to sleep. I'm grateful to count myself among those who watched that day, if but just for a little while. Poet James Dickey, "The Moon Ground"
Additionally, “man on the street” interviews provide an insight into the real excitement people felt at the Moon landing, something which is all too often overlooked today. ABC News anchor Frank Reynolds and science editor Jules Bergman host the coverage, which pushed the technology of the times to its limits. A young Peter Jennings reporting on the news elsewhere in the world, including Vietnam, adds a somber tone to the momentous events. 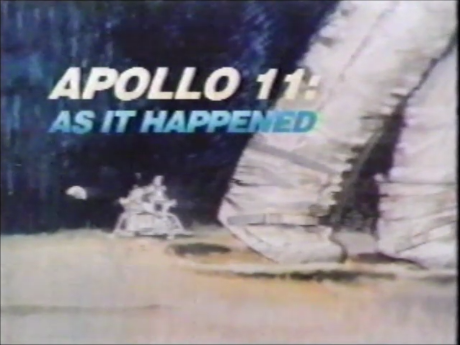 As an artifact for research, Apollo 11: As It Happened provides source material and insight into a wide variety of areas, including broadcast engineering, computer technology, fashion, and language. Along with interviews of various people, including scientists, celebrities, reporters, authors, artists, and everyday citizens – both young and old and black and white – we get a glimpse at "the State of the Union" in July 1969.